Currently I am knitting yet another shawl, but this one is with a twist, the shawl becomes a sweater. It is from my new favorite book Lovely Knitted Lace by Brooke Nico. 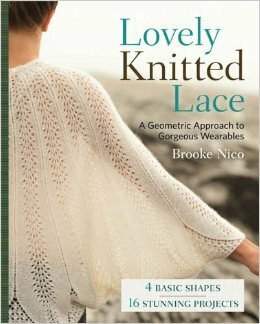 Slowly I am knitting my way through this book, there are some great twists on lace and how to use it for wearable items. The sweater shown here on the front, Camellia Dolman, is my newest project, it is basically a circular shawl that is knit back and forth to achieve edges that becomes the button band. 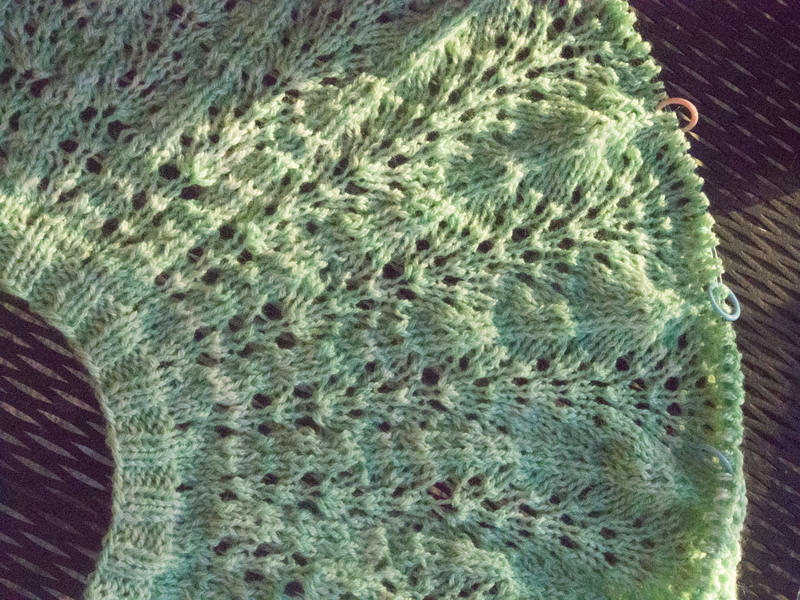 The Helen’s Lace yarn that I purchased at the Lorna’s Laces warehouse sale is being used. This shawl had to be restarted as I did not read carefully and got almost through the first 1/2 of the chart when I realized that I was supposed to just purl back on the even # rows. UGH!, but I ripped it all back and started over. It took a long time for my brain to realize why this did not seem to be large enough for the shawl. 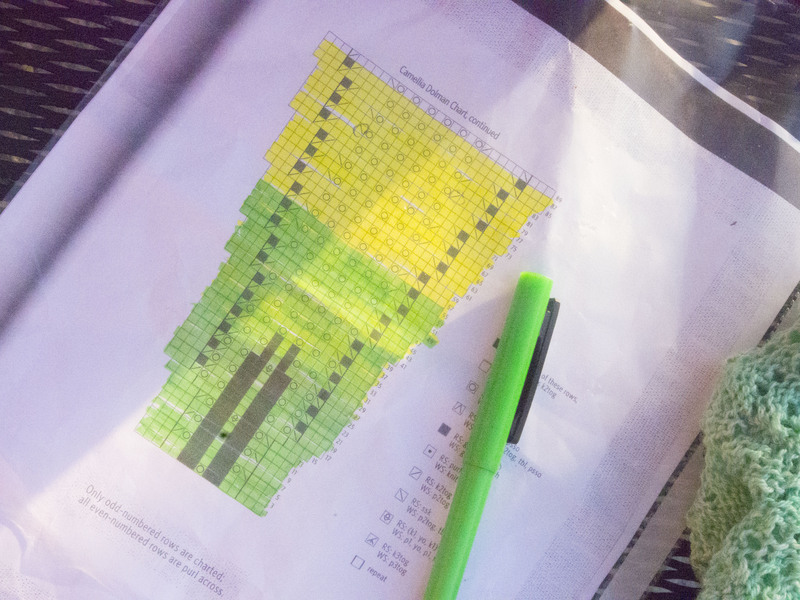 The yellow showed how far I was when I ripped back, the green highlighted area is my progress to date. Not quite sure about this color for me, although I think that it will look great with white pants and jeans as a summer sweater. Progress has been moving along nicely and I realized that the pattern was incorrect in a major way, it asked for 3,000 yards of 2 separate yarns (6,000 in total)…. 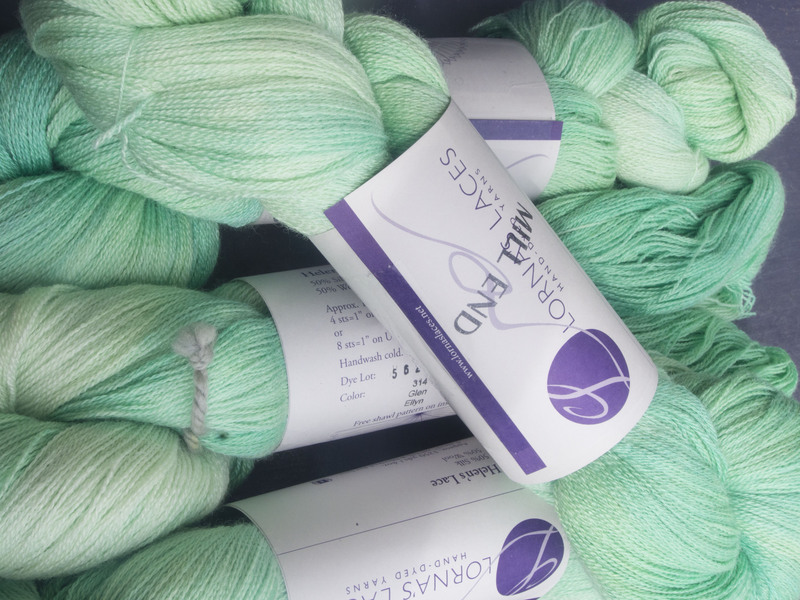 in reality if you look at the breakdown, it is 1,500 yards of 2 different lace weight yarns, or 3,000 yards total. This would have made a huge difference in my purchasing as 1,500 yards is a lot cheaper than 3,000 yards! Now I even think that I could make this again with a handspun gradient, after I see if I like the fit of course. The other errors in the pattern are that the increases are every 12th row, not every 6th row as stated. The charts are correct, I am not sure about the written pattern as I do not use them. Also, she neglects to tell you to bind off, I was wondering if the sweater was made by sewing live edges together, but could not figure out how to block the shawl prior to sewing if that were the case. In spite of the lack of proper editing or pattern testing in this book, I love these patterns. It just would be hard for a new lace knitter to figure out what is wrong without the corrections. What a beautiful shawl! I wish I didn’t have so many projects going right now or else I would run out and get everything to make this right now!! Definitely love your color choice! That color is so popular right now and will look great during the summer. Even at the beach! Thank you! I had not thought of this as a beach sweater, but that would be really fun. This is so pretty, shawls are like shoes….you can’t have too many! Ask Sofia!